UPDATE: We completed the ride from Houston to the Canadian Border at Morgan MT on July 22nd, 2014 after 29 days of biking! See the video summary of our ride and read the daily journals of our ride here! The Keystone Pipeline, if all phases are completed, will cover a distance of 2,151 miles (3,462 km) from Alberta Canada to the Gulf Coast, transporting Alberta tar-sands oil. Phase 1 became operational in 2010, followed by Phases 2, and 3, which currently transport crude oil to Oklahoma and Illinois. The project is owned by TransCanada, who is seeking approval to build a northern section connecting Hardisty (Alberta CA) to Steele City (NE), essentially to replace the existing pipeline opened in 2010. It is this portion that is known as the Keystone XL. This project has been of major concern particularly for environmentalists and indigenous nations. Supporters of the pipeline point to its potential to create jobs, and to reduce the United State's dependence on overseas oil sources. Opponents point to the potential for oil spills, particularly in the case of tar-sands oil which many consider to be more corrosive than conventional oil, in addition to the carbon emitted by tar sands oil production, risks to water sources such as the Ogallala Aquifer, crossing indigenous lands and jeopardizing ecosystems. Because the pipeline would cross international borders, it requires a presidential permit from the Obama administration to begin construction of these expansions. In the past months, discussion has heated up once more, with supporters of the pipeline pushing for approval and opponents protesting against it. 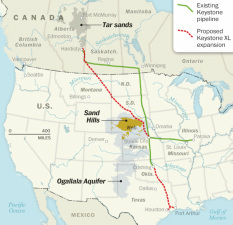 For more information about the Keystone Pipeline, its expansions, and further background of the issue, please see some of the links at the end of this page. There is a wealth of information available, and examining multiple sources is important in gaining a clear picture. My own position is one in opposition to the Keystone Pipeline and all proposed expansions. Whether you support, oppose, or are neutral to the pipeline, I would urge a full examination of facts from all angles. I agree with the standpoint of many environments: that the Keystone Pipeline and reliance on oil, fossil fuel, and pollutive energy sources places our earth at risk, and I feel that there is ample evidence that this pipeline will only increase greenhouse gas emissions, and increase the possibility of oil spills. Furthermore, I believe that, by embracing projects like Keystone, we are continuing down the wrong road. Reliance on fossil fuels and unsustainable energy consumption has placed our earth and future generations in jeopardy. In the face of climate change, which is due in overwhelming part to anthropogenic sources, we must move towards environmental respect and responsibility immediately instead of seeking ways to perpetuate unclean energy sources. It is a time for change, and a time for accountability. It is a time for moderation, for humility, and for compassion. A time to unite, and work together. I feel extremely grateful to live in such an incredible world, and I am dedicated to its future. Because of this, I am prepared to take a stand. There are many ways that individuals can become involved, through speaking up, through taking action, through spreading the word, through educating themselves. To raise further awareness and discussion, and to show my dedication to our earth--which involves opposing energy sources, such as the Keystone Pipeline, that I feel put our earth and all our many relations in jeopardy--myself and my St. Olaf teammate Laurel Ohm are biking from Texas to Alberta following the pipeline route and proposed XL route. Personally, I am biking because I firmly believe that we can change our lifestyles to be more sustainable. Biking and walking are methods of transportation that can greatly cut down our CO2 emissions, and which also cut down our reliance on oil, overseas or not. We have completed bike trips in the 200 and 300 mile range in the past years, and found these experiences not only to be empowering, but also to further connect me with the lands around me. I also hope to inspire others to make a positive change in the world. The Keystone Pipeline is not the only issue our earth is facing, but I do believe that it represents an important decision, one reflecting what direction our country and our world wishes to take regarding the health of our earth. We are beginning our ride on June 24th, at a pace of approximately 80 miles a day to complete the distance in approximately 30 to 35 days time. We welcome and deeply appreciate your support and urge you to take action for our one and only planet earth. Follow as we ride at our blog, "Earth Ride (The Pipeline Blog)". A HUGE thank you goes to Dan and the makers of JOOS Orange portable solar chargers. They VERY generously donated a solar JOOS Orange solar charger to us to support us! It will be joining us as we ride, and help to charge our devices along the way -- already tested it out and it works beautifully. We are so happy to be able to use solar power as we go! You can help to support this endeavor at http://www.gofundme.com/earthride (or contact us at jemosel@gmail.com).